Having qualified in tenth place in Superpole 2, Camier lined up on the fourth row for Race 1. 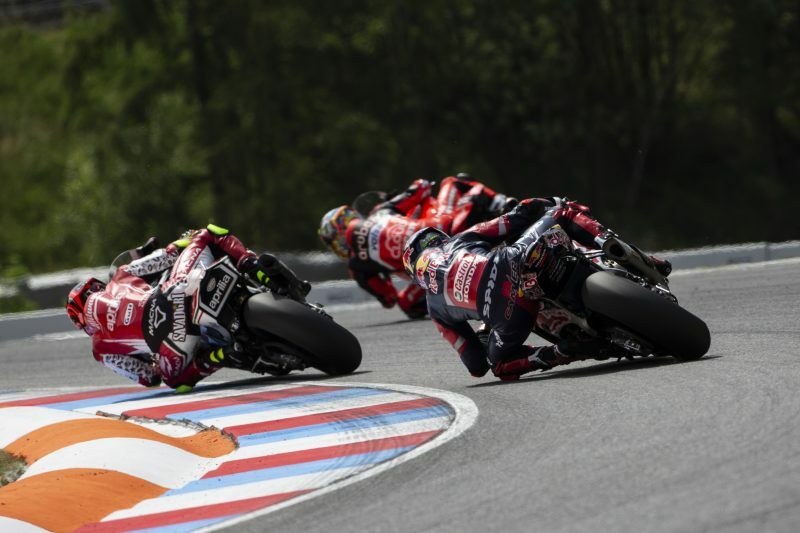 After a cautious start, Camier was battling for a top ten position however four laps after the start of the race a red flag was called due to the air fence needing to be repaired following a rider crashing at turn 5. As a result, the race was restarted and a shorter 16 lap contest ensued. After the restart Camier got a much better start the second time around, making up places and finding himself in an intense four way battle for a top-six place with Laverty, Davies and Savadori. 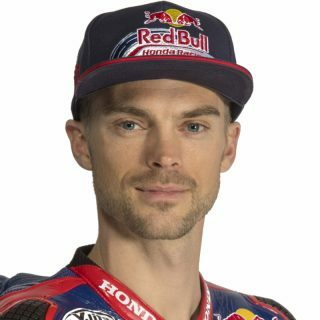 Although he managed to get close to making up more positions in the final laps, Camier crossed the finish line in ninth place adding seven points to his championship tally. 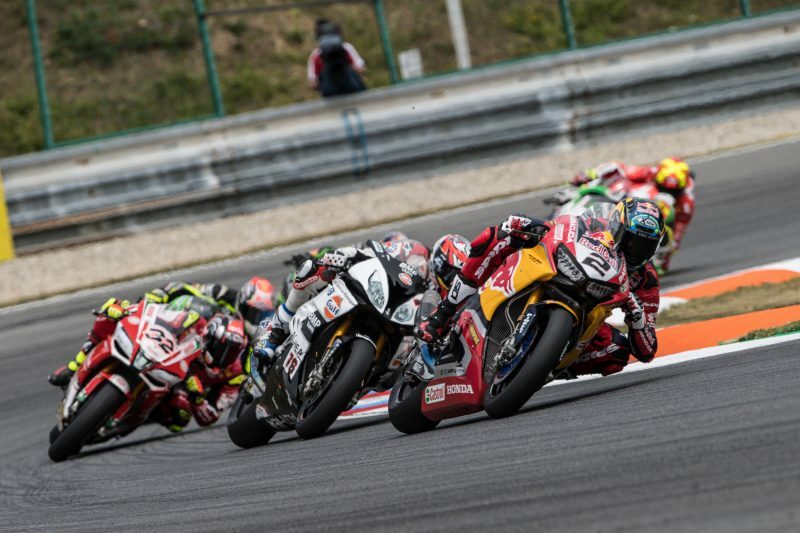 It was a tough first WorldSBK race at Brno for Jake Gagne, the rookie managed to get a good start in the race and managed to gain some positions, however a technical issue on the fifth lap after the restart cut his race short. Race 2 will take place at 1300 local time (GMT +2) tomorrow but before then, the morning Warm Up session takes place at 0935. I’m satisfied with how today went as I felt we got the most out of our current package for this circuit especially having missed the test here which meant we didn’t have much time to find the right setup. In some areas in Race 1 we were quite strong, we just need to work on a couple of weak points to allow me to attack more in tomorrow’s race. Injury wise, this race was a lot easier than Donington, the pain is quite manageable and is only an issue when I’m trying hard to pass other riders. We’ll try making some tweaks to the Fireblade’s geometry overnight to see if we can make a step tomorrow and challenge for the top six again. We made some good changes to the bike today as I wasn’t too comfortable yesterday and right away in Race 1 I felt better on the bike and got a good start. 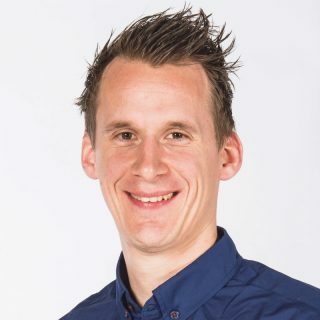 Then we had the restart and my start the second time around really wasn’t good and then I had some problems with the clutch which meant I couldn’t complete the race. It’s a shame but the good thing is we’ve now found a good setting for my Fireblade so I’m excited to see how we go in Warm Up tomorrow. It’s another learning day and we’ll go out and try do a better job in Race 2. Today we had some mixed results, on the one hand another top ten finish for Leon in the first race was promising, especially given he was able to fight for a top six position. 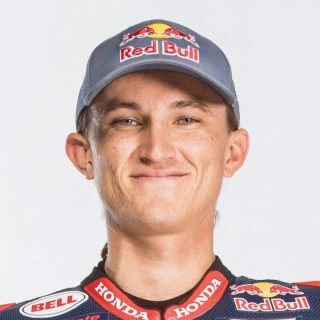 Given our lack of testing here and his injury, this was a positive outcome, we just need to see if we can find a couple of tenths in our setting for the CBR1000RR to give Leon a better package for tomorrow. Unfortunately we had a technical issue with Jake’s clutch, we’ll analyse his bike to see if we can find the cause and regroup ahead of tomorrow. If we can make some slight improvements on both sides of the garage for Race 2, I think we can end the weekend strongly.